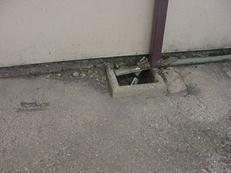 We are highly qualified independent surveyors who can provide help and advice with regard to cracking problems, structural problems, movement in a property, dampness reports, building surveys, engineers reports and much more. We use circles and ovals on our photographs (like the example on the right) and sketches to emphasise problem areas so that you are not left wondering what the problem is. In addition to this if the photographs do not we believe explain the problem enough together with our survey report we also add in one of our own sketches like the ones you will see throughout this article. Please call us on free phone 0800 298 5424 for a friendly chat. An example of one of our photos. The circle is highlighting mould. 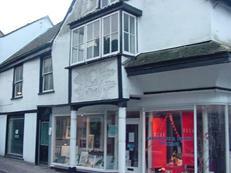 Over the years we have used render in buildings to protect our buildings and decorate them. 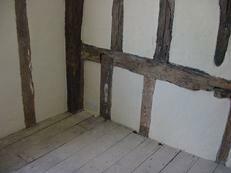 At a glance render from hundreds of years ago looks similar to render that we use today however it is very different in its material properties and how it should be used. Render offers protection to a building, many years ago it was used to protect a timber structure and more recently we would argue that it is being used to allow us to use cheaper materials underneath such as blockwork rather than brickwork or stonework. 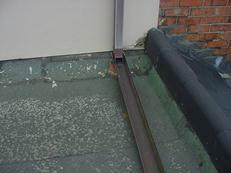 Render then provides protection against the elements of the weather over the different seasons. 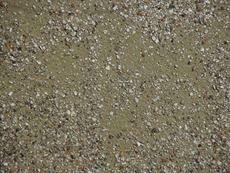 There are many different types of finishes of renders which we will consider in this article. Older style render; what is it made of? In years gone by render has been used as a decoration to depict scenes or to create patterns which were quite impressive and relatively common. 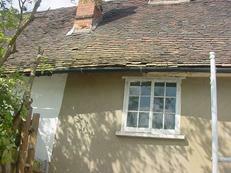 Essex is known for decorative render patterns although we do find these across the country. 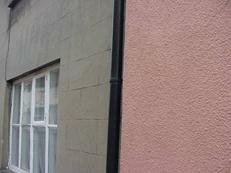 Norfolk and Suffolk are well known for renders finished in a pink or yellow. We have heard rumours, and we are not sure if this is true, that the pink came from a mix of blood and the yellow came from a mix with saffron. 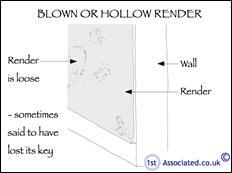 What is render hiding as well as protecting? 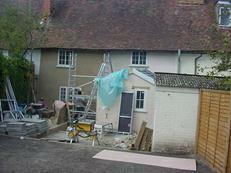 Behind the render coat is often a timber frame which can be affected with woodworm, wet rot and even dry rot. What is behind the render coat? Over the years, particularly since the War years, render started to change with cement being used in the render mix and the modern applied renders such as pebbledash render. Also pre-formed render panels were being used. 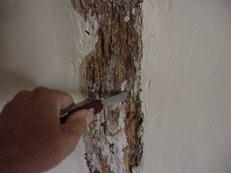 We recently spoke to a plasterer who had used a mix where the colour was impregnated all the way through the render meaning in theory you would never have to paint the render again! 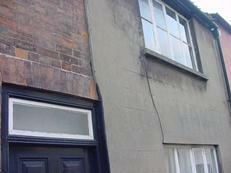 A modern cement render is much harder than an older lime render and works well on more modern properties that do not move very much. 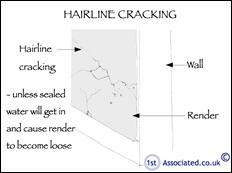 However unfortunately it is often used on older properties where you can get the differential movement between the two properties which can cause hairline cracking. We would always recommend filling hairline cracks as quickly as possible. 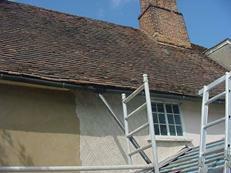 Older style render is often known as pargetting and can be a mixture of lime, ox hair and other locally available materials. 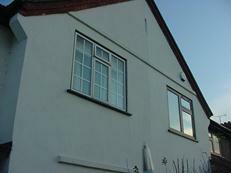 Stucco render is a system of rendering where it is finished to look like stonework. 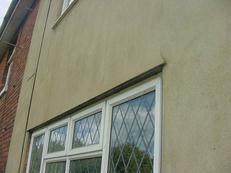 Cement Stucco render – you can tell it is cement from the colour and you can also see the pattern staining below the window. Pebbledash/Peashingle render has a texture to its surface and there are arguments abound whether smooth or textured surfaces are better for render. 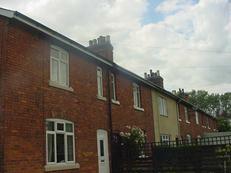 Pebbledash/Peashingle render can be unpainted or painted. 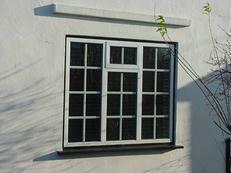 If you look closely this relatively new window has been put in place with a different texture of pebbles around the window compared with the original pebbledash. An area where Peashingle has been better repaired but still stands out where there is cracking beneath it. 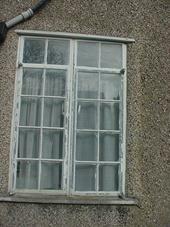 In some cases render is applied to hide defects; this may be a cynical Surveyors' view but over the years we have come across many defective properties which have had defects hidden by the render and in some cases carried out time and time again. 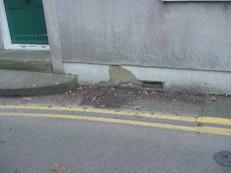 If render was hiding wall tie failure we would expect to see horizontal cracking. Should you worry when you are buying the only house in the road rendered? 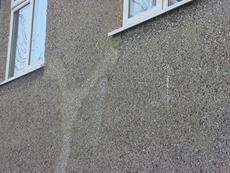 This can also relate to hidden or latent defects where the render has been painted when the property is to be sold. We come across this a surprising number of times and could blame all the property television programmes that recommend you present your house in as good a way as possible. 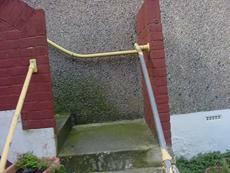 The newly painted render does make it very hard to see where the problems once were. 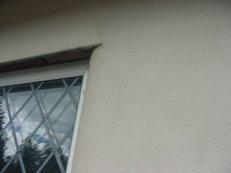 Cracking to render can be caused by the structure beneath and the cracking can be in the render. 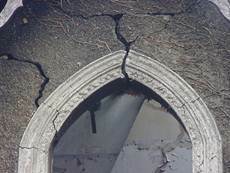 Cracking to render caused by the structure beneath. 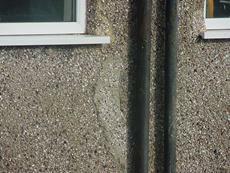 This is known as structural cracking and this is where the problems in the property are so bad that even though it has been rendered over the cracking resurfaces. 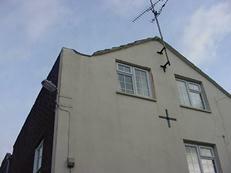 A property with problems, these cracks are structural! For many reasons this can range from differential movement in the property where materials have expanded and contracted at different speeds to hairline cracking where there are window openings and other structural openings. 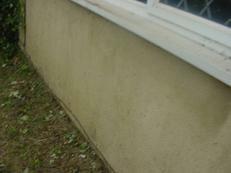 It can be as simple as the render mix being too hard and it has cracked as it has dried. 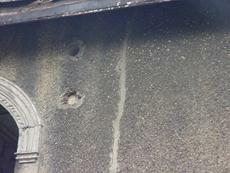 Crack brought about by expansion and contraction of the building. One of the most important things with render, regardless of whether it is an old or modern render, is to understand how to detail a property. Over the years an experienced Surveyor will very quickly assess the quality of rendering; we often base this on the quality of the detailing. 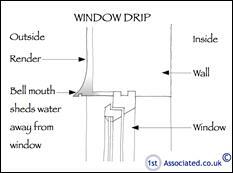 A window drip detail is to keep rainwater away from the window and can often be seen on buildings with render. 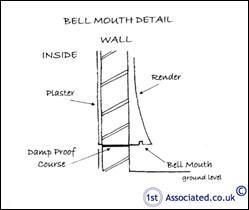 A bell-mouth is a curve at the base of a wall which throws the water away from the structure therefore preventing dampness. 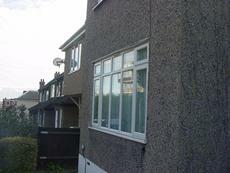 Render where it is used externally is subject to attack from the weather and as such does need maintenance. 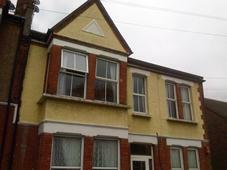 You can often find there is a protective coat of paint applied to the render which does weather over the years and needs to be re-painted with the correct type of paint. How often should I redecorate render? 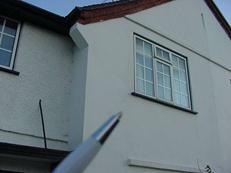 This depends on many factors such as the location and the exposure of the render together with how well it was originally applied to the wall as well as the detailing to the render which allows the water to run off it so it does not cause problems elsewhere. A very general answer would be every four to five years but for example we have managed a property that is right next to the road and ideally it should be redecorated every few years. 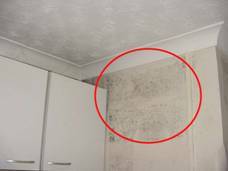 Green mould is often visible to render and sometimes black mould which is a sure sign of dampness. 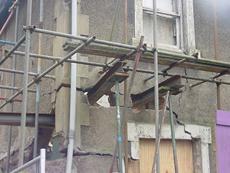 Building Surveys or Structural Surveys? We have a wealth of knowledge and experience as independent surveyors if you require a building survey or structural survey. We are more than happy to send you examples of our survey reports. Please Freephone 0800 298 5424. We have every confidence in our surveys and believe there are no other comparable surveys out there in the UK property and surveying market. We recommend you meet us at the property during the survey so that we understand exactly what you require from your survey report and so we can answer any questions you may have. The contents of the web site are for general information only and are not intended to be relied upon for specific or general decisions. Appropriate independent professional advice should be paid for before making such a decision.